In a new paper Josefine Glamann and colleagues conducted a review of literature addressing the food security- biodiversity conservation nexus. We identified two main branches of literature. The “biophysical-technical” branch focused on productivity, natural science and seeking generalizable, often global models. In contrast the “social-political” branch focuses more on specific contextualized localities with a greater emphasis on economic, political and social factors. Bridging the divide between these two branches is vital for addressing the interlinked problems of food security and conservation. 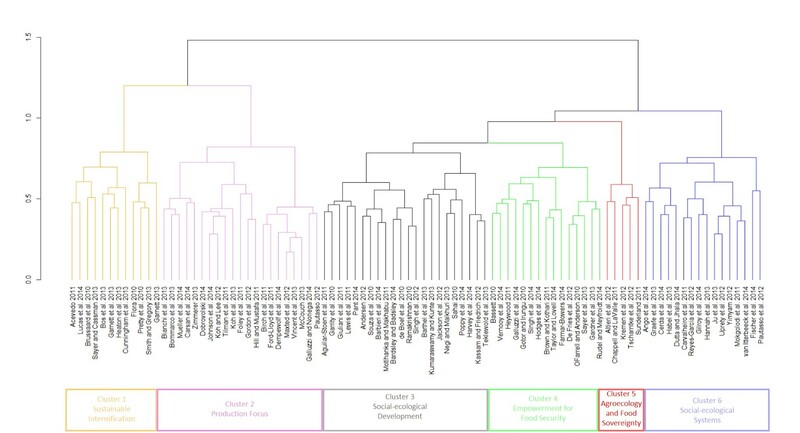 Dendrogram illustrating how the analyzed papers addressed the intersection of food security and biodiversity conservation. Historically, food security and biodiversity conservation have been dealt with as separate issues, each with their own scholarly approaches, debates, and understandings. However, recently there is increased awareness that conserving biodiversity and ensuring the food security of a growing human population are inextricably interrelated issues. Arable land and land under permanent crops cover approximately 11 % or 1.5 billion hectares of Earth’s land surface, and there are approximately 2.7 billion hectares of land under some form of agricultural use, whether crop production, livestock grazing, or agroforestry. Within the next few decades, developing countries as a whole could increase cultivated land by approximately 110 million hectares. Such an expansion of agricultural land, in turn, would pose a major threat to biodiversity, especially because most of this expansion is expected to take place in areas with high conservation value. Despite close connections between food security and biodiversity conservation, there is no coherent body of academic literature specifically addressing the nexus of food security and biodiversity conservation. Different approaches and perspectives are driven, in part, by the assumptions and traditions of the scientific disciplines that engage in this topic. Some existing approaches emphasize single issues such as increasing food production while minimizing impacts on biodiversity. Other approaches strive to address the food–biodiversity nexus more holistically, for example, through social-ecological system analysis that considers the connection between issues such as poverty, equity, and corruption in addition to food supply. Given the limitations of “one size fits all solutions”, pluralistic approaches to studying and managing the nexus of food and biodiversity conservation are to be welcomed. However, we need to better understand the broad types of approaches found in this emerging field, and how these approaches relate to one another. For this reason, we undertook a quantitative review of recent academic literature on the food–biodiversity nexus. The aim of the analysis was to evaluate the framings and perspectives regarding the nexus of food security and biodiversity conservation covered by each article. To that end, a scheme with 68 questions was developed to allow us to consistently assess these issues across the analysed articles. We used agglomerative hierarchical cluster analysis, to find grouping structures within the literature. Research on the nexus of food security and biodiversity conservation is a relatively recent phenomenon. However, already this research appears to be coalescing into two distinct and potentially oppositional worldviews, which are driven by different underlying assumptions regarding both the nature of the problem and the best means to address this. We identified two main branches of literature, containing a total of six clusters of papers. The “biophysical-technical” branch (clusters: “sustainable intensification” and “production focus”) was dominated by the natural sciences, focused strongly on the production aspect of food security, and sought general solutions. In contrast, the “social-political” branch (clusters: “social-ecological development”; “empowerment for food security”; “agroecology and food sovereignty”; and “social-ecological systems”) often drew on the social sciences and emphasized social relations and governance, alongside broader considerations of sustainability and human well-being. While the biophysical-technical branch was often global in focus, much of the social-political branch focused on specific localities. Two clusters of papers, one from each branch, stood out as being particularly broad in scope—namely the clusters on “sustainable intensification” and “agroecology and food sovereignty.” Despite major differences in their conceptual basis, we argue that exchange between these two research clusters could be particularly helpful in generating insights on the food–biodiversity nexus that are both generally applicable and sufficiently nuanced to capture key system-specific variables. To facilitate greater cross-fertilization between research clusters, one major challenge will be recognition of the benefits and limitations of models favoured by the two broad approaches to the food security–biodiversity nexus—relatively simple, generalizable “neat” models versus relatively “messy,” complex- and context-dependent models. Bridging this divide will require explicit consideration of the scientific traditions and related, often normative, assumptions that underpin different heuristic model. George Box famously stated that “all models are wrong, the practical question is how wrong do they have to be to not be useful”. This is a question that researchers on the nexus of food security and biodiversity conservation need to engage with more deeply. In particular, how can relatively simple, biophysical-technical models be usefully contextualized to account for important social, political, and ecological factors that determine real-world food security and biodiversity outcomes? One potential bridge between these two branches is to use a social-ecological systems approach to facilitate improved integration. Both aggregate levels of agricultural production and local conditions influence food security and biodiversity conservation outcomes at multiple scales. Systems approaches acknowledge such cross-scale interactions. Here, the outcomes in terms of food security and biodiversity conservation are conceptualized as responses to dynamic, interacting, multiscale, biophysical, socioeconomic and political processes, or system properties. Relevant system properties include land-use patterns, levels of production and intensification, but crucially also the mediating sociopolitical factors from local to global scales.